Paul Ryan's rise to the national mainstream has given the GOP a great chance to market its approach to the nation's problems. Unfortunately in the last days, Republicans have dropped the ball when it comes to controlling the narrative put forward by Univision, the Spanish media giant. 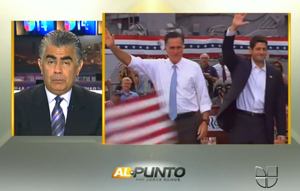 The current accusation by the Spanish media against Romney is that he has doubled down on his lack of concern for the Latino vote by choosing an extreme right winger like Paul Ryan. One consultant claims that Paul Ryan's selection is a "hasta la vista, baby" to Hispanic voters. These accusations are defined as "Hispanic media attacks" by some conservative bloggers. It's not the "Hispanic media" stupid, it is conservatives not showing up to battle for the hearts and minds of viewers. It's infuriating to watch golden opportunities like these slip by, where our lack of serious presence leads to having other forces define us. We should always be on offense, fighting for every single vote. The truth is Paul Ryan is a problem solver, and his immigration solution would be more in line with our Texas solution on immigration from our Texas Republican platform. Paul Ryan supports a guest worker program. This is huge. Who shows more concern for Hispanics? Paul Ryan who supports keeping hard workers here with a temporary guest program or a two faced Obama who divides families and deports in record numbers? The answer is easy to the Hispanic community. The fact that he promised immigration reform but deported in record numbers makes for a nuclear talking point that would crush or seriously hinder any get out the vote efforts of the Democrats. Throw in Fast and Furious and the deal is done. If Republicans at the national level could only modernize, or acquire the talent needed to express these talking points we would own the narrative in Spanish and all Hispanic media. In Houston, our Federation of Hispanic Republicans have been able to dismantle the Democrats on immigration in the media . They no longer bring it up. Temo and everybody:- WE the latinos from Mexico to Patagonia, come here with the WRONG IDEA. Democracy is the dream of the population of LatinAmerica. They are falling into the sistmen they come running out. Now, because they have the power of the communication, be very hard for them to accept they are wrong. The big problem is that they are not NEUTRAL, they make up their mainds that they have the reazon and try to influence the masses. They influence all their viewers and poison the minds. It is supossed they REPORT THE NEWS, no give false opinions and be "lacayos" of the Democrats. Let's face it, the young brown, white and black voters are all over the great state of Texas, but getting them out to the voting booth, is like taking your chance to pulling out an ID Card out of the Top Hat or a jack rabbit. First let's it get this ID Card problem need to be out of the way, out young people got to vote. When out young voters get to the voting booth, this ID card problem, let's make sure we get this out of the way, . I remember when the Poll Tax was a way to keep the voter out of the voting booth. I love jack rabbit chile, but let's get this ID Card out of the way, I don't care what party you support, let's support the voters.